1. Subject learnt by the author through teachers. 2. Informations gathered by experience of the author and contemparary experts. 3. Knowledge gained by author through previous treatises. 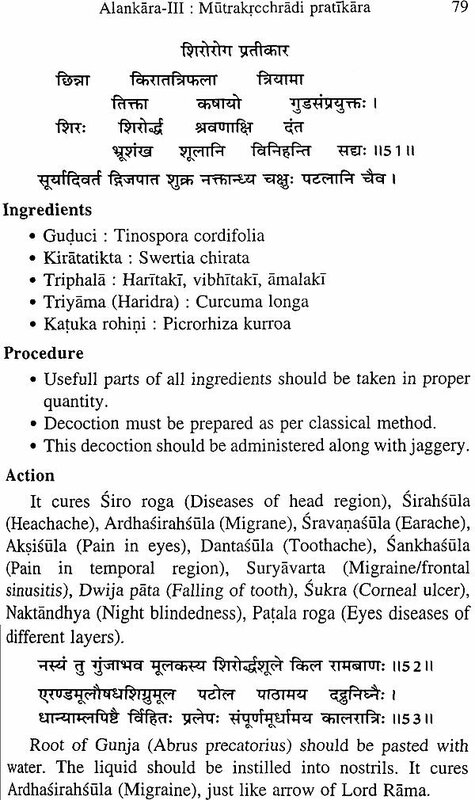 The text is simple form and the language is also easily followable, which deals with Astangas of Ayurveda. It contains 4 chapters and chapter is named as Alankara. The treatment modalities mentioned are very simple, special, cost effective, easily available and easily preparable. Equal importance has been given to Daivavyapasraya cikitsa (Treatment based on spirituality), Yuktivyapasraya cikitsa (Treatment based on rationality) and Satvavajaya cikitsa (Psychotherapy). Medicines and diseases then available are dealt with. In the present work, special method has been followed in translation. Without disturbing the original view of the author, stress has been given for the process of simplification, clarification and elaboration. The text has been designed with three stages. In first stage basic essential informations to understand the text are given. The second division deals with the text proper. All four alankaras are explained systematically with proper procedure and ingredients along with technical clarity. The third stage is the supportive part for second one wherein clarifications are provided. As the work has been done by referring all available manuscripts of Vaidyamrta with appropriate edition and translation, hope will be usefull for Ayurveda fraternity. This is the humble effort of authors in the field of medical manuscriptology. As a badly handled weapon destroys the person himself, similarly, a badly understood treatise harm to the user himself. Ancient seers followed unique way of narration of knowledge which was time tested and applicable for ever. As the time progressed many efforts have been done by many scholars to keep the knowledge of Ayurveda in limelight. Many ancient seers were and recent scholars are putting honest efforts to keep the originality of Ayurveda through their sharing of knowledge by literature and practical propagation. ‘Vaidyamrta’ is one such book working on which gave us immense pleasure and satisfaction. It gives me an immense pleasure to share this unique work on Ayurveda therapeutics with fraternity of Ayurveda. therapeutics with fraternity of Ayurveda. I thank god ‘The Supreme Almighty’ for making this work success and giving a big thing in this small life. Its my duty to express my gratitude towards all my teachers best friends, well wishers, students and patients who made my journey of life more colourfull. They taught me the lessons of life. I solute my father Shri B.S. Manjunath and mother Smt. Bharati whose persistant support, care, encouragement and timely guidance made my life more meaningful. Its my duty and responsibility to thank my life partner Dr. Nagashree who helped and adviced me regarding various technical aspects of the text. My daughter Bhamati who made my life more joyfull must be acknowledged here. God blesses with precious relations in life and such is Dr. Arhanth Kumar in my life. Words are not sufficient to thank him. Who is the co-author of this text, who helped me for the completion of the co-author of this text, who helped me for the completion of the co-author of this text who helped me for the completion of the work. He gave many inputs and informations regarding different technical aspects. He stood behind me through and work of this book. I thank each and every person who helped directly or indirectly for the successful completion of the work. I bow my head to the supreme power Lord Santinatha and Bhagavan Bahubali for giving me the great opportunity to translate the treatise ‘Vaidyamrta’ in to English. At the same time, my respectful salutation to 108 Aryika Kundusri Mataji, Late 105 Ksullak Padmasri Mataji, 108 Munisri Mahimasagarji Maharaj and Dharmadhikari Rajarsi Dr. D. Veerendra Heggade Ji for their divine blessings and concern on me and my family. Words are never sufficient to express my deepest gratitude and salutations to my parents Mr. Chandrashekhar A. and Smt. Nagarathna A. for being with me in all good and bad moments of my life. They were being my role models and supporting and caring force always. Without them this work would not happen. I express my deepest gratitude thanks to my life partner Smt. Nandashree for being with me in all critical situations and supporting me and my career. Without her encouragement and assistance this wouldn’t be completed and successful. I desire to express my deep gratitude and thanks to my brother Mr. Vijay Kumar A., Sister Mrs. Rashmi A., Sister in law Mrs. Navarathna H.P., Brother in law Dr. Arun Jainer, nephew Prasham and Avichal, my uncle Mr. Mitrasen Jain and Satyendra Kumar and and my relatives and well wishing friends for their continuous support, without them this work wouldn’t have reached this level. Salutations to that respected teacher who showed the place of the one who pervades the vast universe with all its movable and immovable things. I bestow my deep and adorable bowing to one such resepectable teacher Dr. Shreevathsa, who showed me the length and breadth of the knowledge of Ancient Indian Medical Heritage i.e. Ayurveda. Words are not enough to express thanks to him for his continuous care, concern and support in all my professional and personal achievements. At this juncture, we would like to thank and acknowledge Ashok Guptaji and Sunil Guptaji of Chaukhambha Vishwabharati, Varanasi for giving us great oppourtunity and providing platform to publish the translation work on the manuscript. Ashok Guptaji, Sunil Guptaji and their team always supporting us and encouraging for the upliftment of the great medical science i.e. Ayurveda. We would like to show our greatest reverence to all our teachers, students, relatives and well wishers. Knowledge gained by the previous treatises. The text has been written in simple, understandable form of Sanskrit language. Father of the author was Manika Bhatta. It was written at Ahmada Nagar in the year 1547 AD. 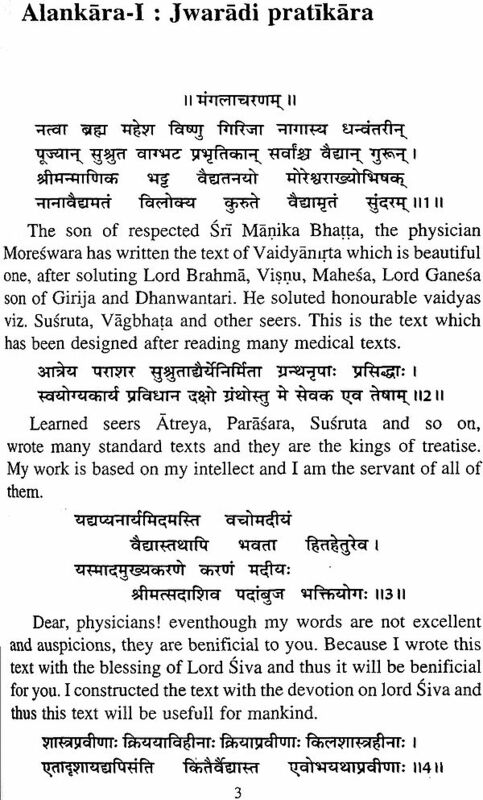 Vaidyamrta along with the commentary Ayurveda Deepika written by Jyothi Swaroopa was published by Banaras (1867). A hindi commentary written by Ramanatha Bhatta is also there. Vaidyamrta with marathi commentary and translation written by Krishna Shastry Batavadekar is published from Mumbai (4th edition, 1862 AD Bambai). Vaidyamrta with Simhali language is published from Colambo (1870 AD). Hariprasad Bhagirathaji, Mumbai edited Vaidyamrta, The manuscript was collected by him through Vaidya . Prananathji, the resident of Sumeru Pura. Later it was translated to hindi by Pandit Vasathi Ramji, Pandit Ramabhadraji made the corrections of the same and later Vaidyamrta printed at Jagadeeshwara Press, Mumbai (Shaka-186 Vikrama-1959). Vasati Ramaji was belonging to the place Beri. Isabgol is indicated in Jwaratisara (AI. 1.22), which the clinical experience of author. 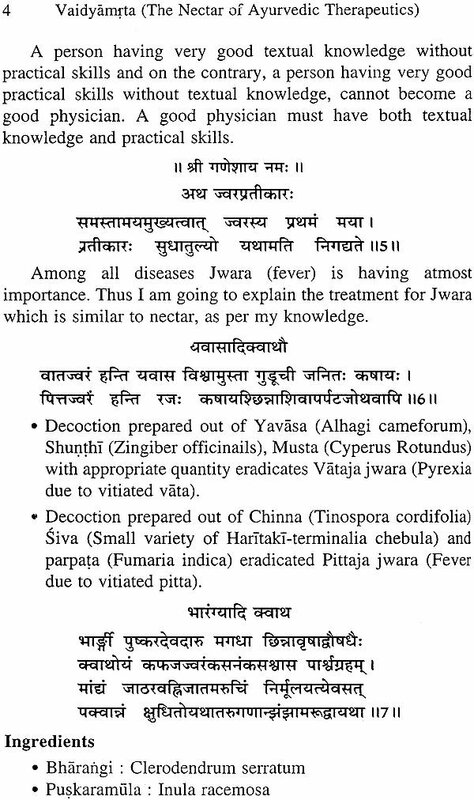 Sunthi putapaka swarasa and Bilwa putapaka swarasa are indicated in Atisara (A1.n 1.25-26) The formulation 'Gurutatwa vati' is mentioned, which the author learnt from his teacher (AI. 1.27-28). 'Lahi curna' an unique formulation is mentioned, which is an experimented and experienced formulation told by Dhatri named Lahi. To state the duration of 7 days 'Muni Mita Dina' is used 'Muni' represents seven sages here (Saptarshi) (AI. 1.45-46). 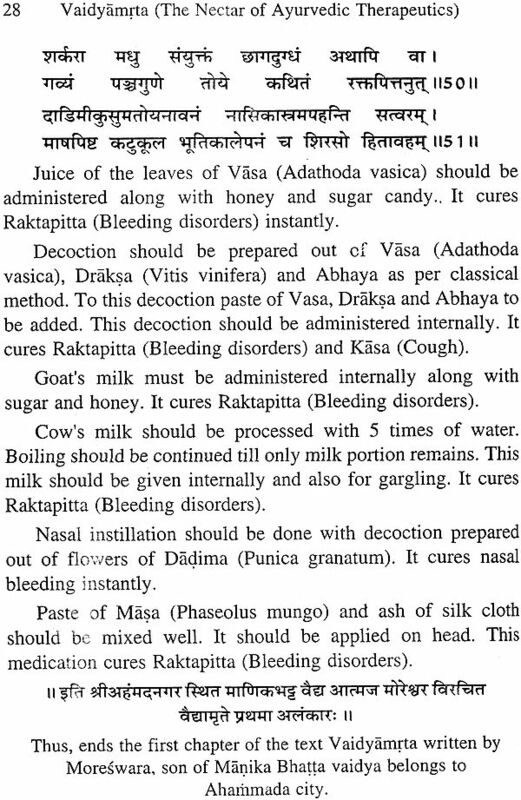 ( Katukoola bhooti (Ash of silk cloth) is indicated for application which is unique (AI. 1.51). Term 'Veda sankhya' is used, which represents four parts (AI. 2.7). 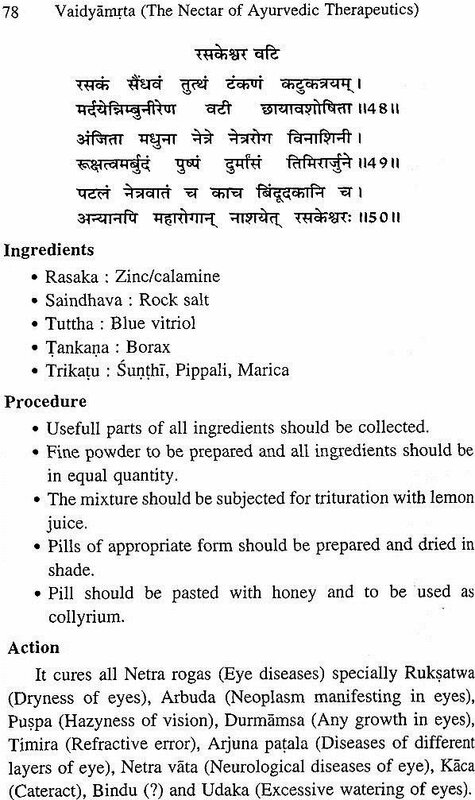 Root of sarapunkha is indicated for fumigation in Swasa-kasa (AI. 2.10). 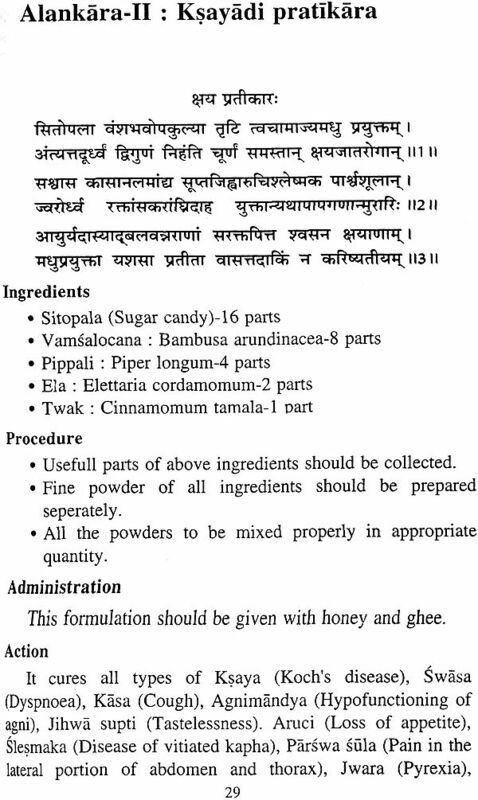 Capala (Bismuth) is the ingredient of Kasa swasari gutika (AI. 2.16). Highly simplified procedures for Bhasma preparation are given. Eg: Tamra bhasma for Kasa and Swasa (AI. 2.17-18). 'Srikhanda' said to be invented by Bhima, is mentioned for the treatment of Trsna (AI. 2.24-25). Tejohwa which is mentioned as the ingredient of formulations given under Vatavyadhi cikitsa, is considered as Jyothismati in the text of hindi translation (Pandita Basati Ramakruta Bhashanuvada Samalankrta) (AI. 2.30). Nayana bhaga, Indu bhaga, Bana bhaga are the terms used to represent 2 parts, 1 part and 5 parts respectively (AI. 2.35). 'Nalika yantra' is the unique instrument mentioned in the preparation of Sankhadrava rasa (AI. 2.50-55). The text is the conversation between two learned person as the author used the word 'Priye' (lovely woman), 'Sakhe' (dear friend) oftenly in different contexts (AI. 3.2, 17). Daiva vyapasraya cikitsa has been in corporated practically. Eg. Worshipping Sttala Devi (AI. 3.37). Vrscika taila is indicated in Karna roga (AI. 3.43). 'Balli rasa' is the ingredient of formulation indicated in Stri roga (AI. 4.1). In hindi translation its translated as Bhallataka rasa. But it seems better to consider as Malli rasa i.e., juice of Mallika which is indicated in Stri roga. Subject contents are continuous. Its very interesting to note that there is no starting colophon for each chapter. But ending colophon is like this: The Sanskrit language used is very simple and everybody can understand this. Complete text is in the form of verses. Some drugs are explained with synonyms in use during author's period. At the end author gave details about self, i.e., place of residence, descriptions about family, diety he was worshipping, method he followed to write the text, period during which the text was constructed. The text explained treatment specifically. Specific formulations, specific to certain diseases are explained here. Ingredients, quantity, method of prepration, indications, dose and vehicle are explained for formulations according to requirement. First Alankara narrates about the treatment of Jwara (all types), Jwaratisara, Atisara, Arsa, Ajirna, Vis Visucika, Krmi, Pandu, Raktapitta. Second Alankara explains the treatment of Ksaya, Kasa-swasa, Hikka, Swarabhanga, Arocaka, Cardi, Trsna, Murca, Daha, Apasmara, Vatavyadhi, Vata rakta, Urustambha, Amavata, Sula, Udavarta, Gulma, Pliha roga and Hrdroga. Third Alankara speaks about the management of Mutrakrchchra, Mutraghata, Asmari, Prameha, Vrsya yogas, Vajikarana yogas, Medo roga, Udara, Sopha, Anda vrddhi, Gandamala, Slipada, Vidradhi, Vrana-bhagna, Nadi vrana-bhagandara, Upadamsa, Sula, Kustha, Udarda, Kotha, Amlapitta, Visarpa, Visphota, Masurika, Ksudra roga, Mukhapaka, Gala roga, Danta roga, Karna roga, Nasa roga, Netra roga and Siro roga. Fourth Alankara gives the information about Stri roga, Sulayukta pradara, Garbhadhana prayoga, Garbha sthirikarana, Rakta sthambhaka, Garbha patana, Sukha prasooti, Yoni sula, Yoni sankocaka prayoga, Garbhapata prayoga, Stana roga, Stana dugdhavardhana, Bala roga and Visa cikitsa. Beginning of the text starts with 'Mangalacarana whereas the text ends with Granthakartr prarthana and Sika'. As the work contains detail about author, its very easy to analyse the text with its contents. Equal importance has been given to all eight branches of Ayurveda (Astanga ayurveda), The treatments given are simple and easily applicable. Three to five treatment modalities are given for the diseases, but for many diseases only one treatment modality has been given. Controversial issues and ambiguity are very minimum. Clarity about the subject is evident throughout the text. Few drugs which are unique in this text, are enlisted here. Anghri daha :Burning sensation of feat. Urdhwa vata :Upward movement of vata. Netra vata :Neurological diseases of eyes. Thus 'Vaidyamrta' is the text which is an essential for Ayurveda practitioners and thus in the present chapter a note on this text has been presented.